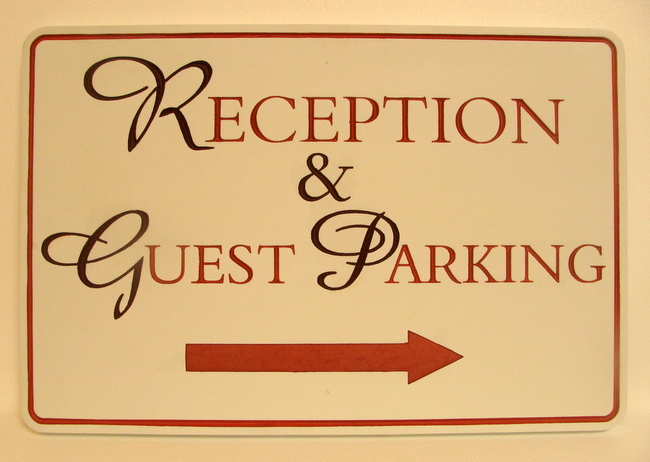 Shown above is a custom carved High-Density-Urethane (HDU) wayfinding sign. It features engraved/recessed text . an arrow, and a border. The sign's background is smooth. This plaque and similar ones can be made of painted HDU or stained and painted wood of various species (e.g., Redwood, Oak, Maple, Mahogany, Cherry) . This numbers and borders are hand-painted red and black. The sign is clear-coated twice. This sign can be easily mounted with screws or studs on an outside wall, on a wood or aluminum post, oe between two posts.